The Baudelaire's parents die in a fire and leave a fortune behind and now we find out the Quagmires parents also died in a fire and left behind a fortune... Coincidence? I think not. This is the Fifth book in the series of unfortunate events collection and we see the three Baudelaire children heading off to boarding school. With Violet and Klaus attending school and Sunny being made to become a office assistant. I wish i could say that the children got the stay in wonderful dormitory described at the beginning of the book but this is not true, they are put in the orphan shack, a terrible dank place with crabs and moss. All is not to bad as the siblings meet two new friends called Isadora and Duncan who are triplets who unfortunately lost their brother and their parents in a fire, the very same way the Baudelaire's lost their parents. Once again Count Olaf is never far away and has the children running laps all night, night after night causing the children to be exhausted which is turn causes them to start failing school and in Sunny's case her job. 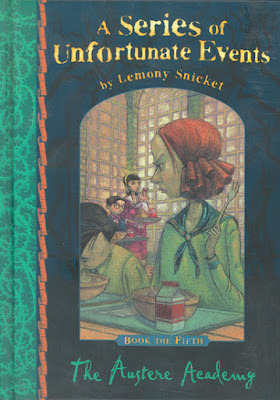 Soon the Baudelaire's and the Quagmires hatch a plan to trick Count Olaf but will it work. Klaus and Violet have to pass an exam set by vice principle Nero or he has threaten to expel them. Can the Baudelaire's evade Count Olaf and pass Nero's exam to avoid being kicked out of school and straight into the hands of Olaf himself? I enjoyed this book, again like the previous one i couldn't remember this one from when i read it as a kid. I liked the fact it was based at a boarding school rather than just with another guardian it made a nice change of scene. I also loved in introduction on the Quagmire triplets, this in turn i think i leading to a much bigger plot line involving how their parents died in the same way and the Baudelaire's parents so it will interesting to find out if they are connected in some way. Without giving away what happens in the book i am excited to find out what happens next with the Quagmires. I found Nero to be a terrible man, the Shack he made the Baudelaire's live in was just terrible and all the stupid rules he set up for the school was just unbelievable, makes me rethink all the rules we had in school and think maybe they weren't so bad after all. Carmelita Spats reminds me of an old bully i had at school, so rude and obnoxious you just want to slap her in the face. She just adds to the misery the poor children are already going through. It makes perfect sense that she was Olaf's special stupid as misery like company as they say. In conclusion i have chosen to give this book 5* on goodreads i really enjoyed it.